With an area of 3000 m², the pitched roof of the SOLON SE office building in Berlin-Adlershof provides functional green areas and terraces for its staff. The ZinCo Floraset® FS 75 drainage elements are installed, between the shear barriers, onto the thermal insulation layer and are then covered with substrate. The anchored roof profiles absorb shear forces. 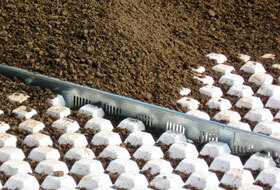 The substrate interlocking with the studs in the drainage element Floraset® FS 75 helps to prevent slippage. It’s nice to take a walk around the spacious roof area in the fresh air, even if it is raining. 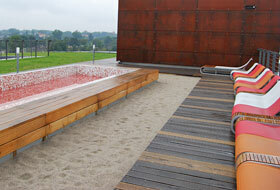 Clear lines and colours, with sand and water features, give this roof terrace a contemporary look. Weather permitting, outdoor events and receptions can be held on this spacious area around the little bar. Decking and balustrades surround each of the five courtyards that draw light into the office areas of the administration building. There is always somewhere pleasant to relax on the large, telegenic grassy areas. The roof-integrated 164 kW photovoltaic system at the new SOLON SE headquarters is an in-house-manufactured special unit that runs the length of vaulted green roof. The awning with its photovoltaic modules runs right round the office building together with a water pool for collecting water from the roof, so that it can be put to further use. Since 2009, the Science and Technology Park Adlershof in Berlin has been home to the new headquarters of the solar technology company, SOLON SE, combining offices and manufacturing facilities under one roof. SOLON SE is one of the largest manufacturers of solar modules in Europe, creating solar system technology for large-scale roof areas and greenfield sites. The vaulted triangular form of this office building, its roof sloping downwards in a south-easterly direction, is architecturally impressive. The obvious solution of a solar roof was not chosen for the SOLON SE building but a green roof, so that this 3000 m² roof area could be used for staff and visitors. 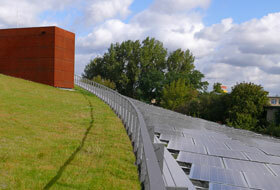 Stairwell towers, clad in rusty CORTEN steel protrude conspicuously through the green roof and provide access to the roof area. This appealing roof landscape is surrounded by an awning made of solar modules, offering shade and solar power. This project is a success, marked by economic, environmental and social sustainability. Architect Heinrich Schulte-Frohlinde from Berlin had overall responsibility for the project and landscape architects, hochC also from Berlin, provided the design for the challenging roof area. A network of pathways with right-angled turns runs through the extensive grassy areas. 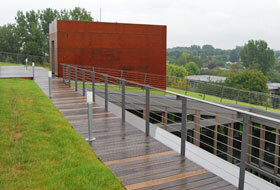 Wooden decking made of native, untreated oak offer space for comfortable seating beside the stairwell towers. The highest section of the roof, at over fifteen metres, is also the section with the lowest pitch. This area accommodates small trees planted randomly like umbrella-shaped june berries, loungers and a small strand around a shallow pool. Near the lifts there is room around a small bar for outdoor events and receptions. Greenroof systems manufacturer, ZinCo GmbH, provided the perfect solution for the green roof with an average pitch of 12°, which enabled the contractors to carry out the planned concept with its many and varied designs. 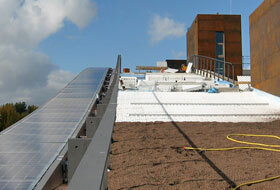 Specialist roof gardeners, fairplants-system GmbH, were responsible for the expert installation. As the 40 cm thick roof was poured from impermeable concrete in one piece, it has no expansion joints. A 16 cm thick thermal insulation layer made of extruded polystyrene is installed onto this root-resistant base. The most important factor in greening the inverted roof was to ensure that the system build-up was such that it enabled water vapour to diffuse from the insulation material. Therefore, the next layer was a water-resistant but vapour-permeable sheet. 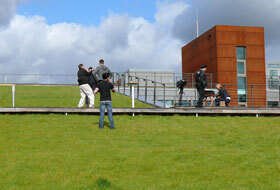 This was followed by the ZinCo drainage element, Floraset® FS 75 as the core element in the green roof build up. The Floraset® FS 75 was installed with the studs facing upwards, so that it could interlock well with the substrate once the latter was laid. Excess water is guided through the openings in the drainage elements to the roof outlets, ensuring the required permeability of the inverted roof. However, before this drainage layer could be installed, measures had to be taken to address the issue of shear force. To prevent slippage, shear barriers were anchored at invervals of between 6 and 10 m, depending on the roof pitch. In addition, special profiles made of steel plate and tailored specifically for this building were used. These profiles, between 160 and 225 mm in height, not only absorbed the shear forces but also served to distribute rain water evenly. The shear barriers were anchored across the entire roof insulation membrane using steel bolts in water-impermeable concrete. In order to ensure it remained sealed, the bolts could only penetrate the concrete roof to a maximum depth of 5 cm, in line with structural calculations. In addition to the 2850 mounting bolts required for the shear resistance, many other anchor elements were needed on the roof for securing the balustrade posts and steel structures used for the wooden decks and walkways. While the described method of construction with water-impermeable concrete is costly, it does dispense with the need for penetrations to be sealed which would be very labour-intensive. It also allows the client flexibility when installing other elements at a later point in time, e.g. loud speakers. Once the shear barriers were in place, the Floraset® FS 75 drainage system was installed across the entire roof area. Bringing these 1 x 1 m boards made of 100 % recycled hard foam up to the roof area was a “breeze”! However, the job of transporting 1000 tonnes of bulk materials to the roof was a different matter. 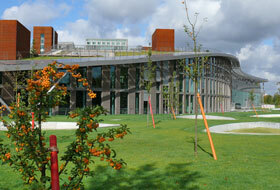 A 16 cm deep greenroof substrate was used for the grassy areas. A gravel substrate was used beneath the wooden walkways and for the channel flow strips at the roof edge. Using silo vehicles, the substrate was easily piped up to the roof and distributed. A mobile crane with a reach of 42 m was used to transport the rolls of turf up to the roof. The pallets of turf were lifted up to the dizzying heights without a problem. The time required for carrying out the green roofing works including planting was about ten weeks, using on average four to six workers. An essential factor in the overall smooth operation was the close co-operation with site management, who were co-ordinating a number of works in parallel, in line with a very tight schedule and with absolute adherence to deadlines. This green build up allows for suitable growth conditions to be created for the grassy areas even on such an extreme roof location. 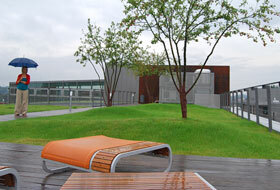 A lawn is in the category “intensive green roof” and requires regular irrigation, even after the growth phase, and maintenance such as cutting and fertilization. For this reason a drip irrigation system was planned that would also provide sufficient moisture for the green roof during dry periods. For the 5 m tall trees that were planned for the terrace areas, a substrate layer of about 50 cm was installed, which would provide sufficient space for the roots. The root balls were anchored using a special steel mesh, ensuring the required level of wind resistance during the rooting phase of the trees. The green area of the roof typically retains about 70 percent of precipitation and also serves to cool the building. Excess water is collected in a tank system and used for drip irrigating the green roof, as mentioned above. 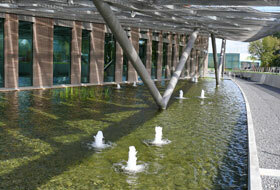 The large water pools that surround the office building are supplied with grey water that is further used for toilets and for irrigating the garden. Outside, a large-scale parkland is created with graduated percolation cascades. Rain water percolation, which is of environmental significance, will therefore become an essential design feature of the parkland. Sustainable planning and building means taking into consideration social factors just as much as economic and environmental factors. The former refers to the user and therefore to user perception. The new SOLON SE company headquarters fulfils all requirements to the highest standard. 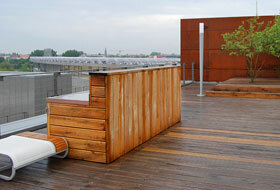 A roof landscape has been created that is accessible to everyone and can be used like an open space. 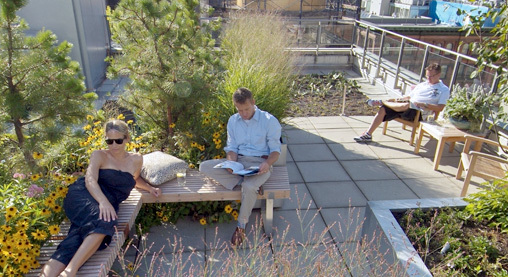 Staff and visitors have the opportunity to take a relaxing break up there or to hold inspirational meetings “al fresco”. The roof terrace provides a very special backdrop for events and receptions. Thanks to laptops and WLAN, the workplace can be relocated to the roof, something that is part of the flexible workplace concept at SOLON SE. An holistic approach with the guarantee of well being for all involved.